Who doesn't love the holiday season?! I mean they call it the most wonderful time of the year for a reason! There's so many fun events to attend from family gatherings to office parties to getting together with friends and more, we're all running from place to place all season long. One thing to keep in mind is that all of this running around, partying, drinking, and indulging in sweets can definitely take a toll on our skin. However, there's a few simple things you can do to keep your skin looking its best through the new year. 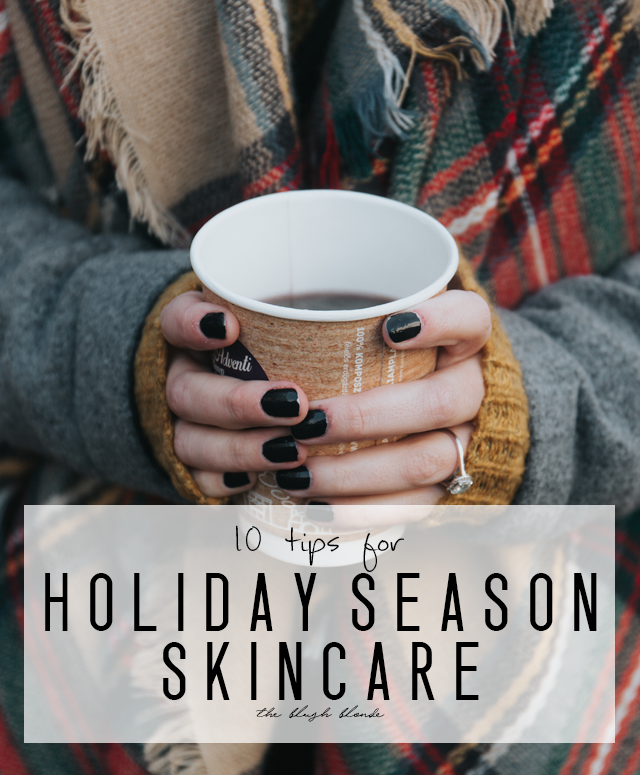 Below I've got my ten best tips for getting your best skin during the holiday season so it's the perfect accessory to any of your holiday looks! It's always important to drink water, but especially during the holidays because it is such an indulgent time. During the holiday season a typical person eats more sugar, drinks more alcohol, and has more caffeine than usual. I mean who can turn down all the amazing desserts, cocktails, and holiday coffees/teas that are available this time of year? While being indulgent is fun, it's important to know that it does take a toll on your skin (sugar can cause breakouts and both alcohol and caffeine are very drying to your skin). Drinking water helps to flush out toxins and keep everything hydrated. Aim to drink at least eight 8 ounce glasses (64 ounces) of water a day and make sure to increase that on a day when you're a little extra indulgent (especially with the alcohol). 2. Always take off your makeup. Another thing that's important to do all year long. If you only do one thing for you skin please make it is this. This is especially important during the holidays because you're more prone to sleeping in your makeup after a holiday party. Leaving your makeup on clogs your pores, ages you, irritates your skin, and overall just makes you feel gross. Do yourself the favor and take off your makeup no matter what, even if you just use a makeup removing wipe and don't wash the rest of your face (not that I am recommending this, but it's better than leaving your makeup on), your skin will thank you. 3. Put together a quick and simplified skincare routine for late nights. For those late nights at holiday parties, family get togethers, etc. put together a paired down skincare routine that you can quickly do before climbing into bed. Take off your makeup with a wipe, wash your face with gentle cleanser, and apply a moisturizer or treatment (depending on what your skin needs). By doing this you'll save valuable time and get in bed earlier without sacrificing your skin's needs. 4. Listen to your skin. Pay attention to what your skin needs and use products to target that. Your skin might be behaving differently based on what you're indulging in this time of year and also your skin may be affected by the weather too. If your skin is dry from alcohol and caffeine add a more hydrating moisturizer, if your skin is breaking out from sugar use a product with salicylic acid, and so on. In order to keep your skin looking its best you need to be able to see what it needs and treat any issues that arise. 5. Use a sleeping mask for a quick fix. An overnight mask is great way to quickly fix any issues your skin may be having. Sleeping masks are gentle treatments that are meant to be left on the skin for long periods of time and therefore they do not contain any harsh ingredients. They can treat a variety of issues from dryness to dullness to acne and more, you can find one for pretty much whatever your skin needs. Cleanse your face like normal and then smooth on a thick layer of a sleeping mask, allow it to soak in for about ten minutes before getting it bed, and wash off in the morning. 6. Use a face mask once a week. To keep your skin in tip-top shape it's important to do a face mask once a week, especially this time of year. A face mask is a way to treat your skin more intensely than you have been during the rest of the week and therefore address any issues you may have noticed. Face masks can be used to deeply clean skin, exfoliate, deliver intense hydration, and more. If you want to get fancy you can also multi-mask to treat multiple skin issues, you can learn more about multi-masking here and here. 7. Always wear a good lip balm to sleep. This is the time of year when lips get super chapped and crack, which is not fun or cute. You want smooth, hydrated lips for comfort and for optimal lipstick application (especially for matte lipsticks). Putting on a rich lip balm or mask every night before bed is a great way to show your lips some TLC and prep them for any holiday makeup looks. My all time favorite nighttime lip balm is this, and I also love this super hydrating lip mask. 8. Use a sheet mask after a long flight or drive. This time of year a lot of people are traveling whether to see family or take a vacation and it's really important to remember to take extra precautions for your skin to keep it looking its best. My skin gets insanely dry when I fly so my trick is to take off my makeup and do a hydrating sheet mask as soon as I get to my hotel room (or someone's house if that's where I'm staying). By doing this I replenish all the moisture my skin loses during the flight and help it to recover better. If you're driving to your destination it's also a good idea to use a sheet mask once you get to your destination to give your skin a boost of hydration and deal with any stresses your skin encountered during the drive. 9. Make eye cream and under eye masks your besties. There are lots of late nights during the holiday season, which can result in puffy, tired looking eyes. A good eye cream and eye masks can both help to prevent and treat tired eyes. For prevention make sure to use a hydrating eye cream at night before bed (even in that paired down routine I talked about in #3); I love this and this. In the morning using an eye gel to cool and treat puffiness is also important, something with caffeine is great to make you look more awake, try this or a roller like this to massage the eye area. For a more intense treatment use an eye sheet mask, I recommend using these at least once a week and then when you need a quick fix. These are my absolute favorite eye masks and then I really want to try these too. 10. Use an illuminating primer. If all else fails an illuminating primer can go a long way. I love this one from Erborian because it hydrates skin, while giving it a subtle glow that blurs imperfections. The illumination in the primer distracts from any issues you may be having and gives your skin that coveted glowy look. Even if your skin is looking amazing from all your prep an illuminating primer is still a great product to use to make your skin look even better. What are your best tips for getting your skin ready for the holiday season? 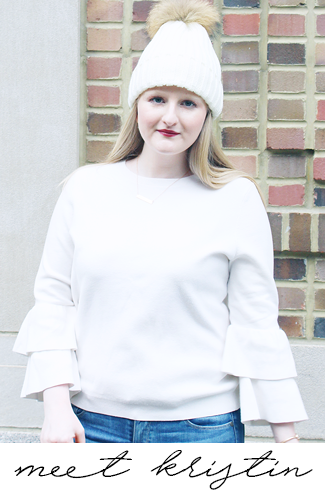 Today I'm linking up with Friday Favorites, and Fab Favorites. I've been wanting to try under eye masks! I always treat my skin a little more tenderly in the winter because it can get so dry. I haven't tried any eye specific masks but I want to! I love all of these tips! My skin always get dry in the winter, so I have to make sure to moisturize like hell! I need to stock up on some eye mask/patches! I have a huge collection of sheet masks ready for whenever I travel or feel like my face is looking sad, but I haven't branched out into the eye patches yet!